Lightspeed Systems Classroom surpasses other classroom management technologies by providing new insights into student productivity via machine learning. AUSTIN, TX. — Ed-tech solution provider Lightspeed Systems, the market leader in K-12 student safety, has released a cutting-edge device monitoring solution powered by artificial intelligence. Classroom represents a step up from current K-12 device monitoring technology by assessing student productivity with AI. The cloud-based Lightspeed Systems Classroom is a disruption to classroom device monitoring technology. Competing solutions such as GoGuardian for Teachers rely on teachers to continuously monitor classroom device activity as it happens. In theory, live monitoring solutions help teachers pinpoint students who are off-task or falling behind; in practice, teachers struggle to track the activity of 30 students at a time, and interpret screen views and scrolling activity timelines. Monitoring those screens keeps teachers tied to their desks and devices. Classroom — included at no additional charge with the Lightspeed Systems Relay web filtering solution, and available for purchase as a standalone product — leverages machine-learning AI to provide insights into student browsing behavior. Rather than depend on teachers to identify unusual browsing on sight, Classroom alerts teachers when it happens, zeroing in on students who may be distracted or struggling. Although teachers have the capability to live-monitor student device screens with Classroom, the solution’s alerts free them from that responsibility, allowing them to leave their desks and focus on other tasks. Classroom is available today for Chrome and will feature support for Mac devices starting next week, with support for Windows devices beginning in June. Relay gives the ability to filter any device OS by deploying Lightspeed Systems Smart Agents. It also features simple SSL filtering; a Parent Report Generator; and Smart Play, a YouTube management feature powered by machine learning. To learn more about Classroom, visit www.lightspeedsystems.com/classroom. To learn more about Relay, visit www.lightspeedsystems.com/relay2. New device monitoring system Classroom uses a proprietary algorithm to alert teachers of unusual student browsing behaviour. AUSTIN, TX. — Lightspeed Systems, the leading education technology provider for schools, released a new student classroom management product today. Lightspeed Systems Classroom is a cloud-based software solution that uses a revolutionary technology to alert teachers when students are browsing off-task on classroom devices. Lightspeed Systems Classroom gives teachers insights into unusual student browsing behaviour. Most classroom management solutions give teachers views of classroom device activity to, in theory, help them pinpoint students who are distracted or falling behind. In practice, teachers struggle to track the activity of 30 students at a time and monitoring all those screens keeps teachers tied to their desks and devices. Classroom — included at no additional charge with the Lightspeed Systems Relay web filtering solution, and available for purchase as a standalone product — revolutionises the traditional model of classroom management by using a proprietary algorithm to identify students with unusual browsing activity (i.e., those who are distracted or falling behind). Teachers receive notifications of that unusual behaviour, freeing them from their desks so they can focus on other tasks. Threat Check combines critical online activity insights with real-world information to help schools identify threats and high-risk students so they can react to help ensure school safety. AUSTIN, TX. — Today, Lightspeed Systems announced a new element to its Relay student safety and filtering solution: Threat Check. Threat Check provides schools with information that can help identify high-risk behaviours and prevent school violence, self-harm, bullying, and more. Using advanced machine-learning technology, Lightspeed Systems’ data science department has processed and curated data to build multiple, proprietary models of students’ typical online behaviour specific to several differentiating attributes, including age and geographic location. Through its web filtering solutions, Lightspeed Systems has a vast and unique trove of data about the typical online activities of students. This includes web browsing activity; social media interests and posts; online communities to which students belong; searched phrases; minutes spent online; time of day of peak web activity; and more. Threat Check combines that online activity analysis with other data points: School personnel can flag high-risk students and input offline activity such as violence, threatening speech, or bringing a weapon to school. This synthesised insight gives schools a more holistic picture of potential threats, as well as indicators of when high-risk students are escalating toward violence. 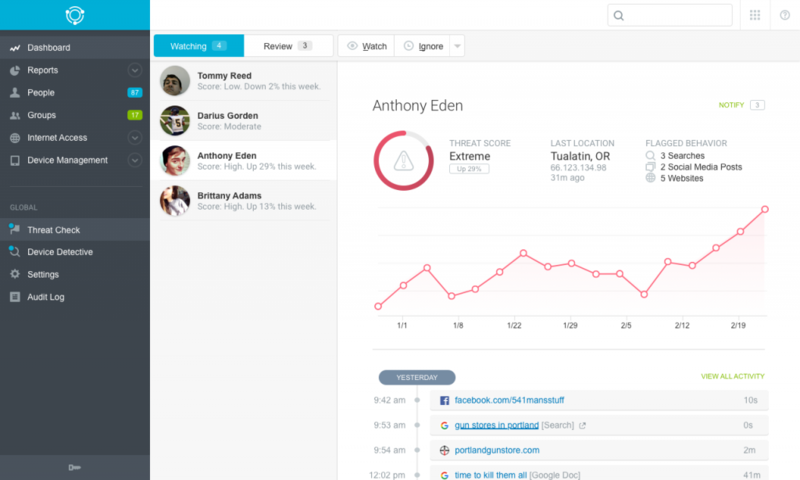 With actionable information in the form of easy-to-consume and easy-to-share trend reports, risk scores, timelines, and real-time alerts, Threat Check arms schools with the information and tools they need to keep their students safe. Alerts and reports can be shared with school staff, safety personnel, law enforcement, parents and more so appropriate action can be taken in real time. Education technology company Lightspeed Systems releases Relay 2.0, a major update of the school IT software solution that brings safe, easily managed filtering to every major device OS. LONDON, ENGLAND, U.K. — Today, at the 2018 BETT show at ExCel London, ed-tech solution provider Lightspeed Systems announced Relay 2.0, a major new release of the filtering/monitoring solution Relay that offers real-time safety and hassle-free filtering for every device. While version 1 of Relay is compatible with only the Google Chrome OS operating system, the game-changing Relay 2.0 uses smart agents to make filtering for every OS easier and smarter. The cloud-based Relay 2.0 eliminates the need for multiple systems to filter, monitor and manage all those devices with features for granular user activity reporting; content filtering, including social media and SSL sites, with flexible policies; real-time suspicious activity alerts; and geolocation for lost and stolen devices. And all of these tools are available in a single, streamlined UI. To learn more about Lightspeed Systems Relay 2.0, visit www.lightspeedsystems.com/relay2. AUSTIN, TX. —Lightspeed Systems Smart Play — an innovative new tool to ease YouTube video streaming in schools — achieved a milestone today when its database grew to 40 million educational videos. Launched in summer 2017, Smart Play is a proprietary technology from education technology company Lightspeed Systems that opens educationally valuable YouTube videos to students while protecting them from explicit, inappropriate content. Founded in 1999, Lightspeed Systems has been trusted by thousands of schools around the world to make student devices safe, filtered and easily managed. Recognising that YouTube presents many educational opportunities for students as well as many unsafe videos, Lightspeed Systems developed Smart Play as a feature to the Lightspeed Systems Web Filter and Lightspeed Systems Relay. 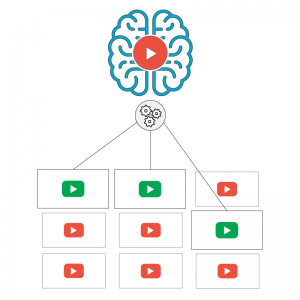 Smart Play utilises machine-learning technology and artificial intelligence to analyse video content and make an unrivalled selection of educational videos available to students. Graphic and inappropriate videos — as well as thumbnails of those videos— are blocked by the solution. Best of all, IT administrators using Web Filter or Relay can enable this revolutionary new tool with just one click in the solution’s interface. To learn more about Lightspeed Systems Smart Play, visit https://www.lightspeedsystems.com/smart-play. AUSTIN, TX. — Education technology company Lightspeed Systems announced the release of Parent Report Generator, new to Lightspeed Systems Relay. This new feature gives school IT personnel the power to customise and automate the delivery of student web activity reports to students’ parents. Relay by Lightspeed Systems is a comprehensive solution designed to make school use of mobile devices safe and easily managed. The all-in-one, cloud-based solution maximises return on investment of school Chromebooks with simple tools for filtering, protecting, geolocating and reporting on the devices. AUSTIN, TX. 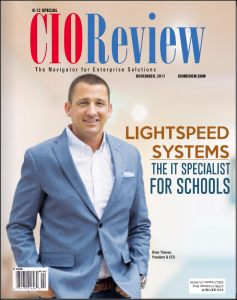 — Ed-tech solution provider Lightspeed Systems is featured as the November cover story for CIOReview Magazine’s Top 20 Most Promising K-12 Technology Solution Providers this year. The latest issue of CIOReview K-12 highlights the innovations Lightspeed Systems has brought to 1:1 device management and web filtering in K-12. Sharing their stories of success, Lightspeed Systems customers Wilson County Public Schools and Glenns Ferry School District reveal how their mobile learning programs have been transformed through the tools and resources available to support K-12 from Lightspeed Systems. 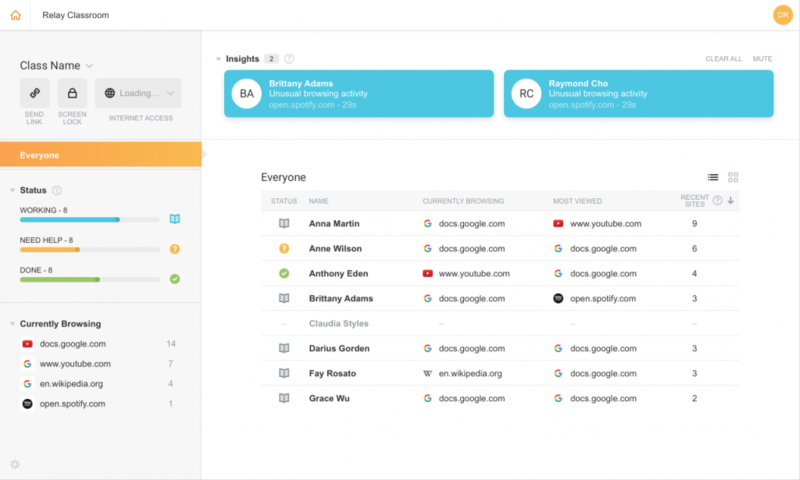 Lightspeed Systems has changed the way schools are able to manage their Chrome deployments with Relay — combining granular filtering controls, powerful reports, real-time alerts, device geolocation plus classroom management tools. Going beyond Chromebooks, Lightspeed powers learning with solutions to manage and filter iPads, Macbooks and Windows devices. Lightspeed Systems is solving the unique problems of K12 schools with innovative solutions like Filter Bypass Controls and Smart Play, the easiest way to allow education-appropriate YouTube access for K-12. Backed by decades of expertise and the most comprehensive K-12 machine-learning web categorisation database, these innovations set Lightspeed Systems ahead of the pack for K-12 filtering and mobile device management. New releases and updates are on the horizon, making Lightspeed Systems the #1 choice for the most advanced technology solutions now and in the years to come for K-12. “We will soon be rolling out the next version of Relay which will take everything we’ve done and multiply it: more powerful filtering and reporting anytime, anywhere, on any device; better features that empower educators to take learning to new heights; and new reporting models that let everyone make smarter student-focused decisions,” said Lightspeed Systems President & CEO Brian Thomas. The ed-tech company adds its full product line to the Illinois Technology Learning Purchase Program catalog, offering K-12 schools robust device filtering, monitoring and management solutions at affordable prices. AUSTIN, TX. — Ed-tech solution provider Lightspeed Systems has partnered with the Illinois Technology Learning Purchase Program (ILTPP) to make its device filtering, monitoring and management solutions available to K-12 schools across the state of Illinois. ILTPP partners with top technology providers to procure superior, cost-effective technology solutions and services. Through ILTPP, Illinois schools now have the opportunity to purchase all Lightspeed Systems solutions at affordable prices. To learn more about Lightspeed Systems solutions, visit www.lightspeedsystems.com. Lightspeed Systems partners with schools to make learning safe, mobile and easily managed. Partnered with 6,500 districts in the United States and 25,000 schools around the world, Lightspeed Systems offers integrated solutions for smarter K-12 school networks: Web Filter, Mobile Manager, Management Bundle for Windows, and Relay for Chrome. To learn more, visit https://www.lightspeedsystems.com. The Illinois Learning Technology Purchase Program (ILTPP) is a statewide cooperative of Illinois K-12 educational organizations that aggregate our buying power and expertise to procure technology products and services at better prices than is available to an individual organization. ILTPP was jointly developed by the Learning Technology Centers, the Regional Offices of Education, and the Intermediate Service Centers in 1998. Filter Bypass Controls, new to Lightspeed Systems Web Filter, prevents dangerous student web behavior by detecting use of Psiphon, UltraSurf, Hotspot Shield and more. AUSTIN, TX. — Education technology solution provider Lightspeed Systems has introduced a crucial new feature to its award-winning school content filter for protecting students online. Filter Bypass Controls, now available in Lightspeed Systems Web Filter version 3.4, gives school IT departments the power to ban and report on the use of web filtering bypass tools. School content filters teach students how to use the internet safely and identify dangerous behavior by alerting school administrators and IT employees of misuse. Student users have turned to filter bypass clients such as Psiphon, UltraSurf, Hotspot Shield, VYPR and more in an effort to get around their school filters. Filter Bypass Controls is a proprietary, AI-powered technology that tracks traffic associated with filter bypass clients, blocks them, and adapts to changes in these dangerous technologies. This feature builds upon the Lightspeed System’s Web Filter’s Multilayered Bypass Protection, a series of features that integrate to prevent student access to security-risk sites including unknown URLs and peer-to-peer traffic. • Lock out users who attempt to bypass the filter for a time period ranging from one to 60 minutes. This powerful technology is available today in the Lightspeed Systems Web Filter. To learn more, request a demo, or receive a quote, visit https://www.lightspeedsystems.com/products/web-filter. After-School Rules, a new feature inside the K-12 Chromebook solution Relay for Chrome, allows schools to adjust after-school and off-campus mobile filtering policies with ease. AUSTIN, TX. — Today, ed-tech solution provider Lightspeed Systems released After-School Rules, a major new feature inside Lightspeed’s Chromebook filtering/monitoring solution, Relay for Chrome. After-School Rules lets K-12 IT professionals customize student Chromebook access after school and off campus, giving schools complete control of student devices wherever they go. Thanks to their portability, affordability and ease of use, Google Chromebooks are the No. 1 mobile device in K-12 schools in the United States, enabling anytime, anywhere learning. After-School Rules lets IT departments adjust Chromebook filtering and reporting policies by day of the week, time of day, external IP address and group. After-School Rules— which can be enabled with just one click in the Relay for Chrome cloud-based interface — makes it easy to loosen or restrict student access to the Internet when students are at home and out of classes. With this innovative feature, IT admins can granularly customize the after-school, off-campus device experience for all groups of users on their networks. For instance, schools can choose to turn off mobile filtering and reporting for all district-owned devices; ease restrictions on social media, gaming and other websites that are blocked when school is in session; or close internet access for elementary school students in the district while leaving it open for middle school and high school students. To learn more about Lightspeed Systems Relay for Chrome and After-School Rules, visit https://www.lightspeedsystems.com/relay.